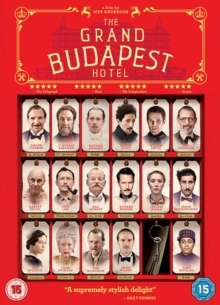 Wes Anderson directs this award-winning comedy set in 1920s Europe starring Ralph Fiennes as a hotel concierge who finds himself mixed up in the search for a valuable Renaissance painting. Gustave H. (Fiennes) is a leading concierge at the Grand Budapest Hotel. An eccentric figure known for his dalliances with older women, Gustave has a one night stand with Madame D. (Tilda Swinton) and finds himself bequeathed a valuable painting, 'Boy With Apple', when she passes away - much to the fury of her son Dmitri (Adrien Brody). With Dmitri intent on framing Gustave for his mother's murder, the concierge and his lobby boy Zero Moustafa (Tony Revolori) hatch a plan to hide the painting and evade the authorities. Will they succeed? The ensemble cast includes Willem Dafoe, Jeff Goldblum, Harvey Keitel, Jude Law, Bill Murray, Edward Norton, Saoirse Ronan, Tom Wilkinson and Owen Wilson. The film won four Academy Awards, the Golden Globe Award for Best Motion Picture - Comedy Or Musical as well as BAFTAs for Best Original Music and Best Original Screenplay.